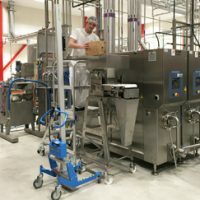 At SIA Glass (ice cream factory) arose a need in the new premises to lift boxes of ingredients high to a funnel in the right working height. The soluion became a cutstom made Lift&Drive 130P. "PRONOMIC`s solution suits us perfectly for this purpose when the lift carriage 130P lifts higher than most in the market and has a high lifting speed!" 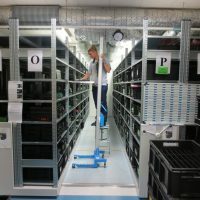 The trolley is used to lift servers around in the Royal Library’s server room, when these need to be replaced or serviced. "The server lifter has improved the quality of work across the entire hall." Lifting off rolls weighing approx. 70 kg. In the process these must also be turned around and put onto the axle that sits high up in the machine. "PRONOMIC’s lifting aids, Lift&Drive and the Expand&Turn tool work very well handling our rolls. They were able to provide a customized mast height and a customized width of the lifting trolley. Right away we got one of their representatives to come over, that was followed up by quotation. They also provided a trolley that allowed us to test it on location. 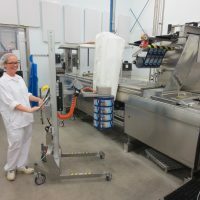 The whole process was efficient and the lifting trolley has resulted in a great improvement to our everyday work!" Lifting electronic parts up onto and from high shelves. The trolley is made in accordance to ESD standards. We chose to attach a ladder for the operator to reach items higher up on the shelves. "PRONOMIC’s masts come in many different heights, and they had a ladder. They were able to meet our needs at a reasonable price. A PRONOMIC salesman quickly came round for a visit and shortly thereafter lent us a trolley that we were able to test on site. All this made us confident we could buy Lift&Drive. 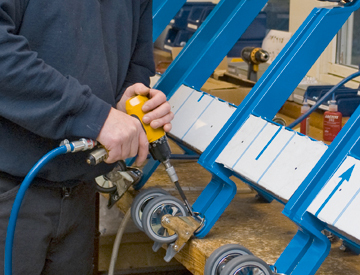 PRONOMIC were very helpful, acted quickly and provide a very good quality, product."